We’ve all fallen behind on a bill or two in the past and had to answer a call from a debt collector. You may have just forgotten to pay the bill, or you may have had a cash-flow problem that month for one reason or another. However, if you’ve ever lost a job or become seriously ill, you may have gotten far more of those calls than you like because you couldn’t keep up with the bills or had to take out more credit than you could afford to cover other bills. You may have been shocked to hear what some of those debt collectors had to say. Everyone has their own ideas about what constitutes “early” or “late,” but the law puts some actual time limits on it. Collectors cannot call you before 8 a.m. and they cannot call you after 9 p.m. If you get calls outside of that time, make a note of the number and time to corroborate with your phone bill. You’ll be asked for that information if you file a complaint. The only exception is if you speak to a bill collector and ask that you be called outside of that time frame. Getting calls from a bill collector at work can be very embarrassing as it can make your financial problems known to people you may not want to know. The law prohibits bill collectors from calling you at work unless you ask them to do so. Again, if you get those calls, make a note of the time and the number. Get the person’s name, as well, if you can. Making threats to scare you into paying has been the go-to tactic of many bill collectors in the past. The law now makes specific prohibitions against threats. Bill collectors are never allowed to threaten you with violence or harm, nor can they threaten to have you arrested for not paying your debts. Collectors cannot threaten to garnish your wages or seize your property unless they have a legal right to do so, such as an auto lender who has a right to seize your car for non-payment. In general, they cannot threaten to do anything that they do not have the legal right to do, including taking legal action against you. Bill collectors cannot use a false name or false company name, nor can they falsely claim to work for a credit reporting company. They cannot falsely claim to be an attorney or a law enforcement representative, nor can they falsely claim that you have committed a crime. Collectors cannot send you documents that are designed to look like official court documents, nor can they claim that papers they send you are legal documents if they are not. They cannot misrepresent the amount you owe. Essentially, collectors cannot lie to you in any way. If they do, they are breaking the law and are subject to penalties. Debt collectors have been known to get quite nasty. In addition to making threats and lying about the consequences you can face for not paying your debts, they can start to get personal and use profane language. The law recognizes this as abusive and prohibits it. Immediately after you get such a call, make notes about what the person said (be specific), the time of the call, the name of the person, and any other relevant details. You will need these specifics if you have to file a complaint. 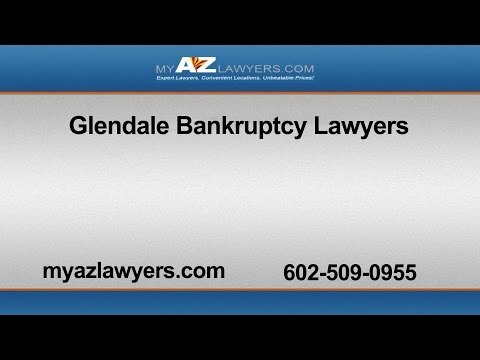 You can put an end to these harassing calls permanently by filing for bankruptcy with a Glendale bankruptcy attorney. My AZ Lawyers can help you understand your options for debt relief. Once you file for bankruptcy, debt collectors are required to stop their efforts. If you continue to get those calls, your Arizona bankruptcy lawyer will step in and handle the collectors on your behalf. Call us today to speak with an experienced bankruptcy lawyer and to understand how bankruptcy can offer you the debt relief you need.